Prince Charles was made an honorary citizen of the city of Nice last night on the first day of a three-day royal visit to France. The Prince and Camilla, Duchess of Cornwall, flew into the city’s airport yesterday morning for what was the first official royal visit to Nice since 1931. British Embassy communications staff apologised to assembled press, including Connexion, for the ‘British weather’ that greeted the royal couple, though luckily it improved as the day went on. 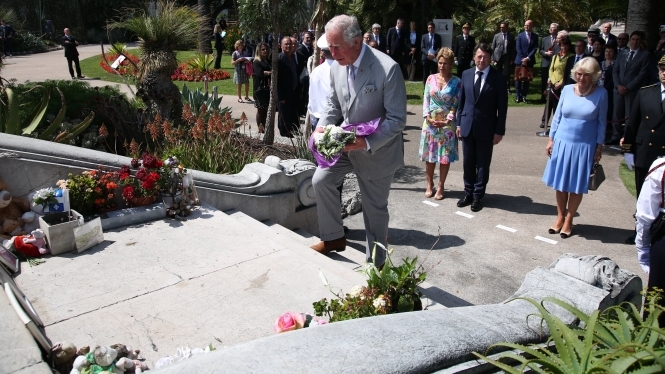 Their day started with a ceremony of homage to the victims of the July 14, 2016 attack on the Promenade des Anglais, at which Prince Charles placed flowers on a memorial and met victims' families, followed by a visit to clifftop village Eze, where they learned about perfume making at the Fragonard factory, before returning to Nice. At an evening reception the Prince and the mayor of Nice, Christian Estrosi, spoke about the historic links between the UK and the city, and the prince was awarded honorary citizenship. Today the royal couple are going to Lyon; they will return to Nice on Wednesday morning for a walk in the town centre before leaving for a visit to Greece. For more about the visit to Nice and the links between Nice and the UK, see the June edition of The Connexion newspaper, out at the end of May.